Even though it is not necessarily attractive, our homes need a system to remove rainwater and snow runoff from the exterior walls and foundation. The common system used here is GUTTERS and DOWNSPOUTS – the aluminum troughs that run around the exterior of your home are the gutters and the downspouts are the portions that run vertically from the gutter to the ground. However, in many Central & South American Countries they have a slightly different system for water removal. 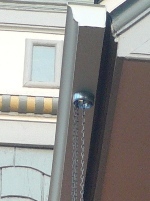 They still use a system of gutters to direct the water flow, but instead of aluminum downspouts they use a system of chains. The chain is attached where a downspout usually would be. The water naturally follows the direction of the chain and flows over the links to the ground. The ground end of the chain can also be placed in a receptacle to capture the water for reuse. I do not see them used in Colorado much, but I did find a house in the Highlands neighborhood that used them in FAVOR of downspouts for a cleaner AESTHETIC! This house has a projecting two story porch. They used chains to direct the flow of water on the side of the porch area. The chains WORK well here for two reasons: The chains are used toward the front of the porch, which is sufficiently away from the foundation to keep the water from saturating the ground near the foundation. Secondly, the porches are open air with VICTORIAN style banisters and columns. It is also a two-story porch with individual shingled eaves per story. 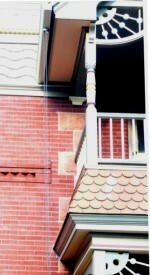 An aluminum downspout would have marred and distracted from the overall design as it ran under the soffit, alongside the column, over the shingles and down the first story column. For this house, the CHAIN system was a GREAT ALTERNATIVE SOLUTION!!! http://www.viridisdesignstudio.com/wp-content/uploads/2016/08/header-logo-1.jpg 0 0 admin http://www.viridisdesignstudio.com/wp-content/uploads/2016/08/header-logo-1.jpg admin2013-07-14 20:52:222016-12-14 22:10:53An Alternative to Downspouts!